Last Monday was the world premier of my new social media newsletter, the 3-2-1. 3-2-1: it’s the greatest newsletter in the history of social media newsletters. 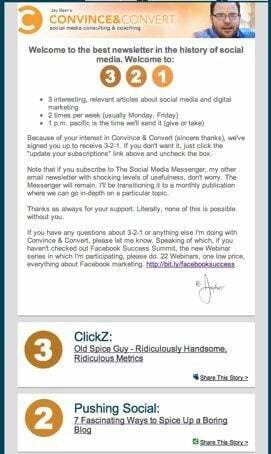 If you’re signed up to receive Convince & Convert blog posts via email, or if you’re a subscriber to The Social Media Messenger – my other email publication – you should be receiving the 3-2-1. If not, just click right here and check the appropriate box on the subscriptions page. I’ll continue publishing the Social Media Messenger after a short hiatus. I’ll be transitioning it to a monthly email publication that goes in-depth on a particular topic. If there are specific areas that you’d like to see me cover in detail, please let me know. Thanks as always for your tremendous support of me and my work here at Convince & Convert, and elsewhere.